Unoffical money changers usually frequent the markets, although lots of legitimate money changing businesses usually exist in larger towns. Banks are not the best option as they usually offer unfavorable rates. Exchanging US Dollars to Riel is very straightforward and it's unlikely you will have any difficulty in changing money. For other well known currencies such as Euros or Baht it is advisable to ask around in a few places before exchanging money as rates may vary. We have heard of people being persuaded to change US Dollars or Thai Baht into Cambodian Riel at border crossings, being told things like "Dollars no longer accepted". This is a lie, and you will be given a very poor exchange rate. You do not need to change any money into Riel, particularly if just staying in the large cities. The one exception is that it may be a good idea to convert Lao Kip or Vietnamese Dong at the border, as these are not easy to change far from the border regions. 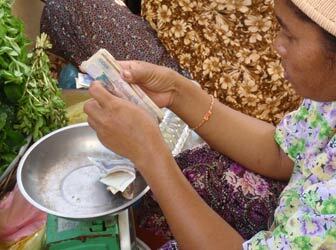 Woman handling money in a Cambodian market.